The nature of physical reality preoccupies Lehene as well, specifically what he describes as the “space in-between cultures” that he inhabits as a Romanian living in the United States. In “Immigrant I,” a T-shirt fastened to plywood serves as his proxy, or what he calls the “temporary home for my body.” Yet in the work, it hangs empty as a trace of the artist, a sign of his former presence. An envelope from the Department of Homeland Security sits on the T-shirt and one wonders, is the information contained within good or bad? To what degree does this governmental agency actually dictate the terms of an immigrant’s existence? In a second version, “Immigrant II,” a dollar bill peeks through the envelope window, raising the specter of a corrupt bureaucracy run amok. For Lehene, the space between cultures is seemingly defined by flux. 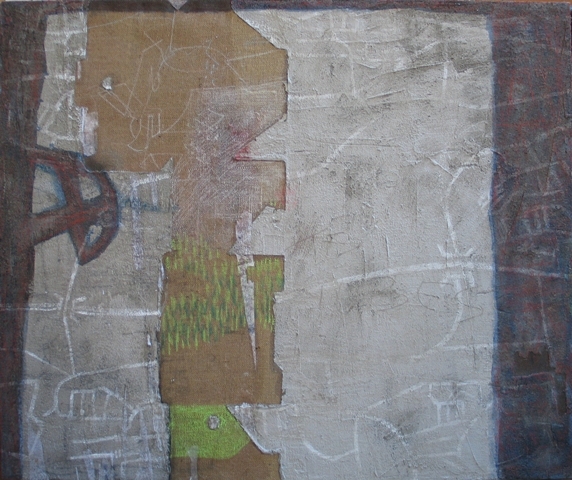 These assemblages have no sense of permanence; everything appears caught in a moment of dissolution or reconstruction. 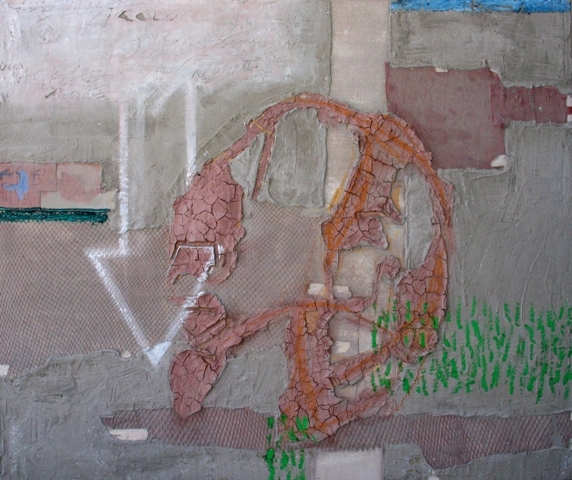 In the monumental “Big Cement with Y-s,” rents in the cement reveal patches of red clay, blobs of amber-colored glue and fragments of newsprint. Lehene juxtaposes headlines like “Airport screening put under scope” with a photograph of a woman wearing a headscarf. This is an old but effective strategy. Excerpt from “Eastern Europeans converge and diverge at Curfman Gallery” by Kiki Gilderhus, published in the Rocky Mountain Chronicle, November 2006.